NU-Q Students Spend Semester in the U.S.
Doha, Qatar – July 3, 2018 – Several Northwestern University in Qatar (NU-Q) students have recently returned to Doha after spending six months on the University’s home campus in the U.S.
“This home campus experience allows several of our communication students deeper exposure to courses not available in Qatar in their own field and in the broader liberal arts. 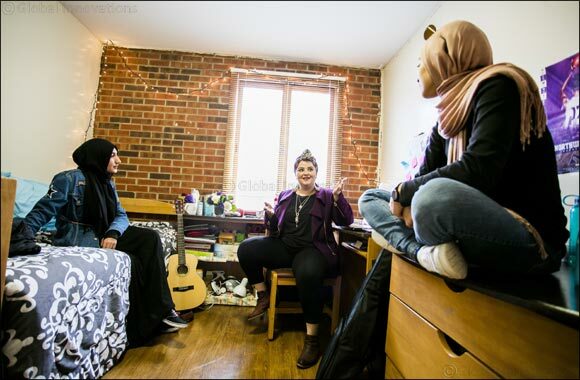 Some students have even been able to craft minors connecting courses in Qatar with those in Evanston,” said Everette E. Dennis, dean and CEO. Among the students who participated this year, was Nada Bedair, who grew up in Alexandria, Egypt. While on the Evanston campus, Bedair joined Sigma, Lambda, Gamma, a sorority dedicated to women empowerment and multicultural inclusion. As the sorority’s Emotional Intelligence Chair, Bedair helped organize events, including one that focused on Ramadan. Bedair also took a course that focused on production, which she says will help her with a project she plans to shoot this fall in Doha. The untitled film, set in Egypt during the Arab Spring, is funded in part through a grant from Studio 20Q, NU-Q’s student-run club that organizes workshops, training sessions, and networking events. Amina Niksic, who started NU-Q with plans to become a director, spent her time in Evanston taking several technical classes, including 3D animation. One animation project she said was “pretty intense but the final product was amazing because we learned to use a very complex program,” Autodesk Maya 18, a 3D computer graphics application. But Niksic may have also caught the acting bug in Evanston. In addition to taking introductory and advanced acting classes, she visited the Second City theater in Chicago, an improvisational training ground for many American comedians including Northwestern alums Stephen Colbert and Julia Louis-Dreyfus. Niksic is now entertaining the notion of a career on the other side of the camera. Oma Seddiq, spent the first 10-weeks of the semester at a journalism internship at Forbes magazine in the U.S., and then traveled to Evanston to take in contemporary art history, magazine writing, and political science. Seddiq also took a class involving popular digital platforms such as Google, Facebook, and Amazon, and their impact on users, especially as it relates to data privacy. Another student, Noura Ibrahim, took production and post-production classes in Evanston, and one class focused on three influential women directors: Nancy Myers, Mira Nair, and Gina Prince-Bythewood. She also enrolled in psychology and relational communications courses, and mini classes in graphic design and hip hop.